Mr. Peanut was dumped by his owners at PBC ACC. 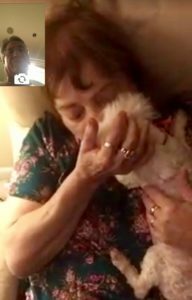 An amazing son surprised his elderly mother with Mr. Peanut after she lost her beloved dog and has been devastated. As you can see from the “FaceTime” photos, there were tears of joy. We heard that Mr. Peanut’s new mom has not let him out of her sight. A picture is worth a thousand words. Mr. Peanut will have an amazing second chance at life and filing a void in his new mom’s heart.